The mother of Bradley Manning, the US soldier accused of leaking data to WikiLeaks, has written to William Hague asking for British consular officials to visit him in military prison to check on his physical and mental health, which she said was deteriorating. Manning, 23, has been in custody since last May in conditions that have provoked widespread criticism of the US military and government. He is held alone in a maximum security cell for 23 hours a day and stripped naked each night apart from a smock. Manning does not have a British passport or consider himself British, his lawyer has said, but because his mother, Susan, is Welsh, the soldier is "British by descent", the Foreign Office confirmed this month. In her letter, Susan Manning wrote that she visited her son in Quantico marine base in Virginia in February, travelling with her sister, Bradley's aunt and his uncle, "but they were not allowed to see Bradley. "I was very distressed by seeing Bradley. Being in prison, and being held in the conditions which he is, is having a damaging effect on him physically and mentally. I am worried that his condition is getting worse. I would like someone to visit him who can check on his conditions. If Bradley's being a British national means that someone from the British embassy can visit him, then I would like to ask if you can make that happen. I do not believe that Bradley is in a position to be able to request this himself, so I am asking as his mother on his behalf." Susan Manning, who divorced Bradley's American father, Brian, when her son was a teenager, also asked Hague for consular support on her own behalf. "If I try [to] visit Bradley again, can someone from the British embassy help me and other members of Bradley's family to deal with the US marine authorities and help with any other arrangements we have to make?" The UN special rapporteur on torture, Juan Mendez, issued a rare reprimand to the US government this week for failing to allow him private access to the soldier. Manning can meet Mendez only in the presence of a guard, where the soldier's comments could be used against him in future court martial proceedings. Mendez said he was acting on a complaint "that the regimen of this detainee amounts to cruel, inhumane or degrading treatment or torture. Until I have all the evidence in front of me, I cannot say whether he has been treated inhumanely". 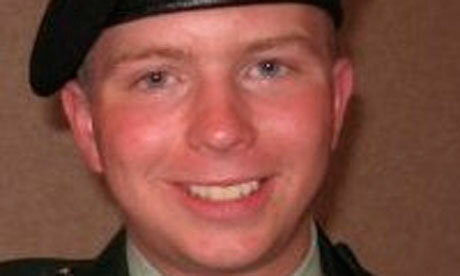 The Pentagon denied this week he was kept in solitary confinement. Manning is accused of leaking confidential data, including more than 250,000 diplomatic cables, to WikiLeaks, on charges that include "aiding the enemy", a capital crime. On 4 April the Foreign Office minister Henry Bellingham said the British embassy in Washington had expressed MPs' concerns about the soldier's treatment to the Obama administration and would do so again. "All people who are detained in custody deserve to be treated in detention according to the highest international standards, and we certainly expect nothing less from the United States." With relation to Manning's nationality, he said: "We must respect his wishes on the matter and recognise the limitations on UK involvement," while noting that the government had not at that point had any requests for help from the British side of his family. The Foreign Office confirmed the foreign secretary's office had received the letter, and said: "We will carefully consider Mrs Manning's letter and will reply to her shortly."